Celebrating Easter has a long tradition. Grown-ups are happy about some days off work on a long weekend and children can’t wait to find all those colourful eggs and eat the candy – allbranded offers your promotional products that are perfect for the festive days. Sweet presents with your company logo are as popular with employees as they are with their children, your customers and business partners. Easter bunnies, eggs, fruit gums or gift baskets are ideal as a giveaway in order to reach your target audience. Used on campus, the inner-city or at school, they will make your company well known. Easter without sweets and the search for eggs has a long tradition. Make children and grown-ups happy by giving away sweet treats and presents for Easter and gain new customers. 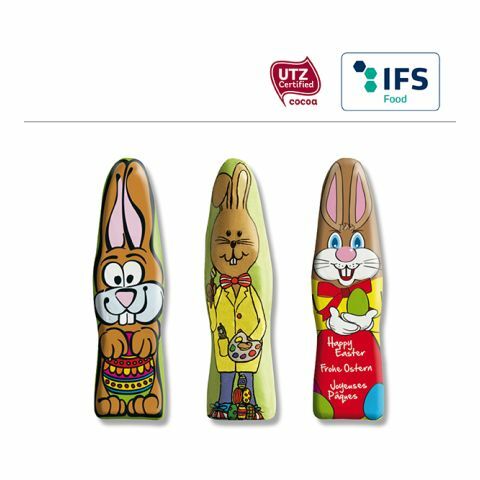 Easter bunnies and other treats in combination with your logo or claim will definitely leave a positive impression and will have a long lasting advertising effect. For people who like it a little bit more exclusive, the high quality gift baskets are ideal and will last for a long time thanks to their first class manufacturing. Seize the chance and bring success to your company by using advertising Easter eggs. allbranded helps you to reach your marketing goals and to make your company well-known. The retail industry already discovered the sales possibilities of products relating to Easter. Treats in the form of Easter eggs made out of chocolate or Easter bunnies made out of mini fruit gums are already sold right after the new year has begun and are being sold for many months. Many companies discovered the possibilities that come along with the Easter traditions. 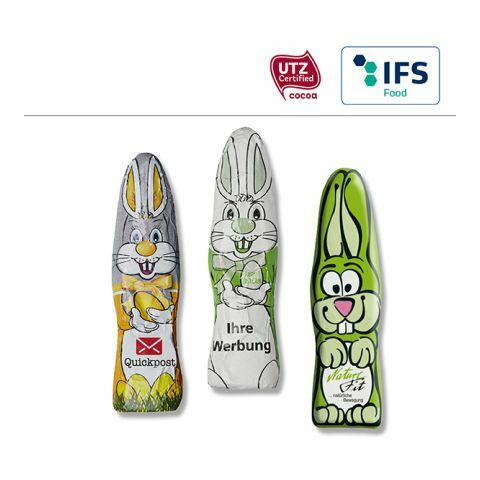 They order Easter related products as promotional products and distribute them among their employees and their children to come across as a family friendly company and a modern, tradition-conscious employer. 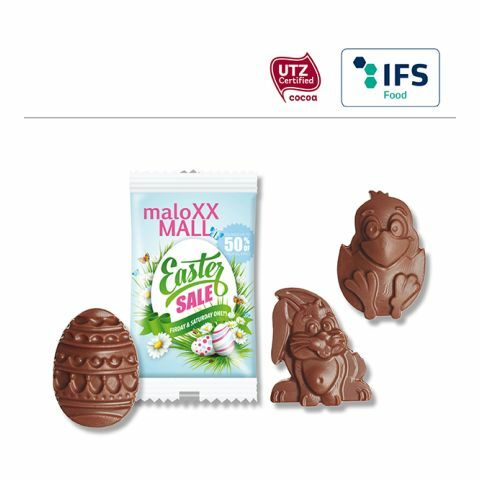 In the online-store of allbranded you’ll find a huge palette of products that can be turned into first-class Easter advertising mediums by printing your logo onto them. There’s a focus on chocolate products of well-known manufacturers such as Kraft Foods or Lindt. Besides the chocolate Easter eggs with standard motives and the MAXI-Chocolate-Easter bunnies made out of whole milk, you’ll also find mini chocolate bars and dragée blisters with chocolate beans. 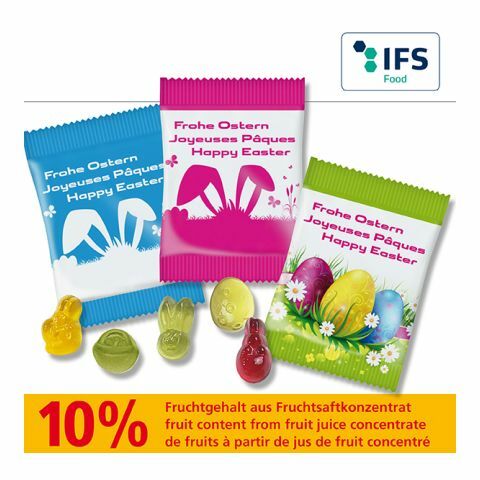 Additionally the store of allbranded also offers different kinds of fruit gums for Easter with standard motives. The fruit gums are mixed with different colours and have the shape of Easter bunnies, Easter eggs and Easter lambs. They consist of concentrated fruit juice, natural aromas and colouring plant extracts. Allbranded is your partner for promotional products that are not only in fashion but also will stand out of the masses. The advertising Easter products mostly cost only a few cents and can also be entered as operating costs. All products can be individualized fast and easy due to their outer packaging. In the shop you can easily add your logo and make sure that the products make the children of your employees happy. Of course you can also use fairs to distribute chocolate bars or wine gums with your logo or claim as giveaways for fair visitors. Order your customizable Easter article today online at all branded!